Can a DME/HME company develop existing sales and build new cash sales at the same time? Yes! However, before you look to expand cash sales, be sure that your current ones are bringing in sufficient profits. Your staff should have the ability to excel with everything your company offers. The continued success of any operation depends on the efficiency of each member of the team. When I say “each” member, please be sure that your deliveryman is included as well as the clerks on the telephones. Your entire team must be involved in the training cycle. At Medtrade Spring in Las Vegas I saw a plethora of new opportunities to expand OTC cash sales and harvest additional profits. I watched as many entrepreneurs, while placing an order for a new OTC line, went several steps further. They made arrangements, as part of their commitment, to have the exhibitor schedule an appointment for their salesperson to teach his staff about this “new” line. Together they planned an advertising program, scheduled open house promotions and “show and sell” days. Of course, they also plan for sufficient literature and samples. “Good” planning and “good” marketing will bring your company “good” profits, Now, isn’t that a “good” way to develop new OTC cash sales? 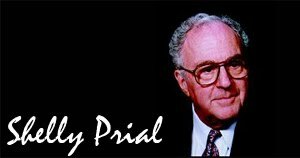 This post is a sequel to an earlier entry, titled "Fraud and Abuse". Fraud: deceit, trickery, cheating (Webster’s dictionary). Abuse: to use wrongly, misuse, excessive use (Webster’s dictionary). Thelma and I moved to Florida about 30 years ago. We are both in our late 80’s and love it here. But little did we know how much is happening in Florida, which I describe as fraud and abuse. I have often written and spoken about this, but I now realize that I was preaching to the choir. Medicare reimbursement! CMS seems to think that DME/HME providers are at fault, and so they are doing everything in their power to delay payments. I saw an article in my local newspaper where they reported that out of the 100 physicians in the United States who received the bulk of Medicare payments in 2012, 28 of them were located in Florida! No other state came close. I always thought Florida was the “sunshine” state. The 2013 figures are not yet available. An ophthalmologist received almost twenty-one million dollars ($21,000,000!) in 2012. And yet our family physician told us how backlogged he is in receiving his reimbursements. This is outrageous! I would like to know how many dollars all the DME/HME dealers in Florida received during the same period. It appears that fraud and abuse fits like a hand in a glove. However that is not true for our small segment of the business. We have so many honest, hard working providers and dealers whose first consideration has always been for their clientele. They are being punished for someone else’s greed! All I can add to this report is to say “Thank You” to AAHomecare and the state DME associations who work so diligently to protect all DME/HME dealers. Follow their lead, and together we can eliminate a great deal of this fraud and abuse. Thelma and I had a delightful visit with a local DME/HME dealer. For us, this was a trip to visit the past, a time when we ran a similar operation. But the truth is that we also saw an interesting view of the future. The industry is changing and this dealer is doing the same. He had his showroom loaded with OTC cash sale items along with the usual products DME dealers stock. It was a privilege seeing such an efficient and well-run operation. Everything they had on display was with a price attached. Wheelchairs, walkers, canes and all other similar items were grouped together, displayed attractively, beckoning customers to “look and seek”. We visited Sego’s Home Medical Equipment, run by Gene Sego and his sister, Juliann. Children of a Registered Pharmacist, both are UF grads, working together in business. They created what I would like to see every DME dealer accomplish. They made their operation the center for the entire community to “stop and shop”. "DME companies must join their state association and AAHomecare to fight the ridiculous amount of audits, CB, etc. We need one united voice It is easy to get frustrated and down at this moment, but we must rally together and fight – Our voice must be heard!" Gene is a second-generation DME provider and a third generation in a family owned and operated company. Ours is an excellent profession. I enjoy, when I travel, meeting his many peers providing great service to their communities. After spending time with Gene, I am positive that we will always be the primary source for home health care supplies and equipment in the United States. Gene Sego will be attending Medtrade Fall in Atlanta. When you are there, please seek him out. How can our industry, DME/HME, stop fraud and abuse? I have spent many a sleepless night thinking about what we could do. Speaking with many experts about F&A, I believe there is an answer. When there are few regulations, not very specific guidelines, and a large cornucopia of money, it becomes an opportunity for F&A. This will attract unscrupulous people who see DME/HME as a chance to harvest many dollars! I am a Registered Pharmacist. After four years in college, studying and learning, I had to pass very strict tests that proved that I was competent. To be a DME dealer, all you have to do is open a store and hang up your sign! When I went to open my first pharmacy, after passing all the inspections and following instructions to the letter, I was granted my license. All pharmacies throughout the country face unannounced inspections to determine that they are following all rules and regulations. The DME/HME profession has made a giant step via ACCREDITATION. This is the first program made to bring recognition of the importance of health care providers. Another thing that must be done is to issue a license. Can the accreditation (license) be suspended or revoked? Yes, and then until corrected, the dealer will be unable to participate in Medicare. When that becomes a fact, it will help keep out many charlatans. There must be specific standards for both the dealers and the services. I am asking Congress (with CMS and Medicare) to prepare rules, regulations, and standards. To be a DME/HME provider or dealer, the principal must earn their license. This industry must operate, as does pharmacy, by licensure. Physicians, nurses, and therapists all require they meet the standards to participate. So must we! I now have seen everything. Yes, this is year 2014. Yes, it is the truth. This “relief” was accomplished in Alabama. This is a very big victory, led by Mike Hamilton, ADMEA. I hope to see many more exciting triumphs as a result of the efforts of the state DME associations and AAHomecare. I receive reports from many of the State DME Associations. I am constantly amazed by how hard the principals and members of these organizations work and how much they accomplish. One of the goals I have is to be able to meet with the many principals of the State DME Associations and AAHomecare at Medtrade this Fall in Atlanta. I am putting in a great deal of effort to see this happen. Medtrade Spring, last month in Las Vegas, was the beginning of the change in direction our industry is making. More and more vendors are featuring OTC cash sale items. A great number of dealers recognize this as a “golden” opportunity, seeking as many OTC cash sale items possible. A careful review of current inventory will uncover one opportunity after another. Rather than allowing merchandise to sit on shelves waiting for someone to look for it, providers are discovering how effective good promotion of specific items can be. Tax relief, when that happens, is a blessing, but building a better line of OTC cash sale items will secure your market share. Since I returned from my tour of duty during WWII, one thing I learned has never left me. It is the importance of teamwork. We all protected each other and we won the war! Today our industry is fighting for survival. CMS is doing their best to delay and hold back reimbursements. That, too, is a most devastating problem, which requires a strong team, as does the “competitive” bid legislation. There are many more puzzles, and these two are a good starting point. Why? This is because there is still a stupendous number of DME/HME dealers who do NOT belong or support these associations. Too many of them are “penny wise and pound poor.” The dues they pay to the associations to keep them in business are so little. Their accountant is aware that it is a normal business expense. He, too, will assure his clients that joining will help keep them solvent. When Thelma goes shopping she looks for the BO-GO items that we normally purchase. You know, “Buy one - Get one” free! If every dealer who reads this will make the phone call, as I suggested in A Redundancy, you will bring new members to the cause and then we will win. When the number of “dues-paying” members rises sufficiently, everyone will benefit. NOT JUST THE ASSOCIATION MEMBERS. WILL YOU GET ON BOARD? If everyone just brings in only one new member, it would make the associations greatly more effective, and when the new members recognize what happened after they joined, well - how about that? I have been patiently watching and waiting for this day. Yes, today we finally turned the corner. When I opened Safari on my computer this morning I received a few more messages than usual. There were at least two dozen commenting about Tom Ryan and AAH carrying the message that all DME/HME providers look for. Tom is bringing to the attention of Congress and CMS that they seemed to have lost their responsibility to the millions of beneficiaries of Medicare and Medicaid. In their zeal to save money, which is being funneled out of the system faster than it can be replaced, they aren't watching where it is going. Tom is showing them the high quality of the services the DME dealer provides. Tom is proud of the efforts of DME/HME companies. He is also calling to the attention of Congress that there are no specific rules and few regulations which leaves a void. This void gives the unscrupulous element an opening to steal dollars! When I saw the large number of messages that I received this morning applauding his efforts it restored my faith in people. Now, more than ever we have a leader with the courage Tom has and we must give him all the support possible. Let him know that you are really excited and then please do everything you can to support his efforts. Call your Congressmen, involve your clientele, give the DME State Associations and AAHomecare anything, no, everything they seek because your future depends on their success. 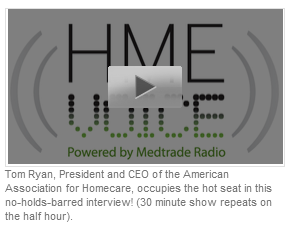 AAHomecare President & CEO Tom Ryan was featured in the most recent episode of HME Voice, powered by Medtrade Radio and sponsored by Emerge Sales. Click here to stream the recorded episode 24/7. In the episode, Ryan answers questions submitted by DME/HME dealers like YOU! I know that I have a tendency to repeat myself very often. I do this because I want to be sure my messages are received and hopefully they will enable you to respond. I have been preaching how important it is during these very threatening days for our industry to work together. No one can stand-alone! So, once again, I ask that every HME/DME dealer become a member of the organizations that guide our industry. As a team we will bring about passage of the Marketing Pricing Program (HR 1717) which is still sitting in committee where it doesn’t benefit anyone! As the principal of your DME/HME company, open the Yellow Pages of the local telephone company directory. Write the numbers of each DME/HME location listed; include the ones you know as well as all the others. Please call each of them on the phone. Do not be bashful; you have to protect your company, and so do they! I assure you they will be delighted to hear from you. If you are a member of AAHomecare and your state DME association, ask them to provide you with all the tools you need to solicit new members. If you are not currently a member; become one STAT. As a member, simply tell them you plan to stay in business and also want them to stay in business. I have been in this industry for more than 60 years, and have always supported the organizations that make dealers more formidable. I have seen how hard the organizations work together to get legislations passed. The efforts of AAH and the state associations has made DME/HME into a major profession. But today, right now, it is sink or swim time! Please make this attempt to protect your business, your family, your employees and all your clientele. Do not allow all your efforts and hard work to go to waste. Our industry needs you and you need our industry. Why not work together? Communication is the key to accomplishing any and everything. These days the luxury of standing alone is no longer practical. This is why I so appreciate reading posts on LinkedIn. I can see and study what other folks in our profession have to say and then pass it on. I do not believe that I have posted more than once or twice on LinkedIn. I feel social media is for another generation, and I am sure they all benefit by this sharing with one another. I try, via these blogs, to share information on current events and marketing ideas that have proven successful. It took me a rather long time to prepare the blog about “Licensure”. This, in today’s economy, can be the salvation for many DME/HME dealers. LinkedIn! To me, the part “linked” indicates that you are part of a chain and “in” is that it is a chain of peers. Knowing this presents the opportunity to tighten the chain and when you are all “LinkedIn’ with AAHomecare and your state DME association, a successful future for all will emerge. Since I personally am in my late 80’s, I can only suggest. I am no longer a dealer but an old C.O.C. (contemptuous old curmudgeon) who tries very hard to listen to all of you and then hopefully l can share the ideas that I receive from you. If you have had a successful promotion or did something of interest, please don’t hesitate to tell me about what you did. Send me an e-mail (shelly.prial@att.net) or call me (321-259-7127) and I will include your idea on one of my blogs! Then we will all be “LinkedIn”. This will not happen unless we all work together! There has to be a way to prevent dishonest or “quick buck” operators from being allowed to participate as DME/HME providers. How many dollars do unscrupulous companies steal out of the system? I would not be surprised if I found nearly half of the reimbursements CMS and Medicare pay for are services that are not rendered. This can be stopped if there are very specific standards to be met before your operation is allowed to participate as a dealer or provider. I am a pharmacist; I had to pass a very difficult test to receive my license. Then, when I built my pharmacy, I could not open the doors until it, too, passed inspection. There were standards for every item required to fill a prescription. It took four years studying in college, and then I had to serve 12 months working in a pharmacy as an apprentice. But anyone who wants to rent a store or an office or maybe just list a telephone number and call it “Jiminy Crickets Home Healer Care” can solicit business. Call 1-234-567-8910 and the company is in operation. Who is running it? It could be "Jack the Ripper". Yes, that is the truth! When I was working as a manufacturer’s rep, I met many of these quick buck operators. They monitored how much was billed to Medicare and Medicaid. When the reimbursements started to approach a seventh figure, they closed the doors and reopened the next day as "John the Curer". How long can this ridiculous situation continue? How can the great bulk of legitimate hard-working honest DME/HME dealers and providers remain in business when CMS has run out of money? From what I see reported, that reality is almost here now! There must be some very dramatic changes made STAT. Licensure is the key! What happened in 2013? A recent poll in HMENews indicated that last year was worse than expected! 58% of the respondents reported a decrease of revenue of 10% or more. However, 63% believe that in 2014 net revenues will remain steady and INCREASE! Well, this certainly isn’t a bed of roses, but I feel that our industry did NOT take as bad a fall as anticipated! After attending Medtrade Spring in Las Vegas a few weeks ago, I returned home feeling very optimistic about the future of DME/HME. The attendees all seemed to be on a mission to find new OTC cash sale products. They filled the lecture rooms and listened to the speakers making suggestions on how to develop new sources of income. It was just reported that US demand for home medical equipment is forecasted to grow 8.2 percent annually, to $12.6 billion in 2018. Yes, 2014 has the potential to be a super year for DME/HME providers; but like anything else worth doing, there is a great deal that has to be done in order to make it become a reality! New legislation, some pending, must be passed. CMS has to be sure that prompt reimbursement is made when properly invoiced. Perhaps a licensure program must be established for DME as there is for other health care providers? To be sure that 2014 will be the year that will see DME/HME recognized for their service, one small step has to be made. Every dealer or provider has to become a dues paying member of AAHomecare and their state DME association. We have no choice. Tempus Fugit and when we band together, work together, become politically activated, and bring our clientele into the picture, 2014 will be the banner year we seek. I have received messages from several readers who feel the upturn has already begun. Get on board, and let us make 2014 the year that we join forces and make a change from storekeepers to professionals. We must earn the same respect of pharmacists, physicians, nurses, and therapists. 2014 will be the year this all happens.